In my last post I explained that laptop overheating is often caused by a gradual build up of dust and fluff in the laptop’s cooling system. If this your problem and you want your laptop working properly again it is going to be necessary to clean the cooling system. I am going to explain how to go about doing that, but first I thought it would be useful to explain how to diagnose an overheating laptop just to make sure that is the problem. This may seem like a no brainer, but the fact is that laptops operate at different temperatures by design and some run very hot indeed. If you compare different machines with different processors you can often feel a difference in temperature, but that does not necessarily mean that the hotter machine is actually overheating. By overheating, I mean that the laptop is running at a much higher temperature than it is designed to operate at. 1. The machine’s cooling fans will work continuously and noisily at maximum speed. 2. The laptop will suddenly shut down by itself without warning, perhaps after only 5 to 10 minutes of operation. 3. The laptop will work fine when it is idling, but will shut down soon after you start to use any software that makes the processor work (3D Games, movie players, image or video editing software, etc.). If you experience one or more of these symptoms then it is reasonable to assume that your laptop is overheating. Nevertheless, you may want to double check, and the easiest way to do that is to download one of the free temperature monitoring programs that are available on the internet. 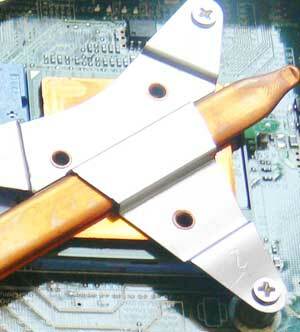 These work by interrogating the digital thermal sensors that are built in to the CPU. The software I recommend is called CoreTemp but if you find that won’t run on your machine try googling for “CPU Thermometer”, “RealTemp” or “SpeedFan” to find an alternative. For the rest of this post I will assume that you are using CoreTemp, but I don’t think you will find it difficult to translate if you are not able to. If you have not seen CoreTemp before you may be surprised at the information it provides about what is going on inside your laptop. For our purposes we are mainly interested in the value of Core 0, which is effectively the CPU temperature. If you have a multicore processor you may also see values for Core 1, Core 2, etc. These are also internal CPU temperatures and they are likely to be similar, but a few degrees difference is not going to be significant. 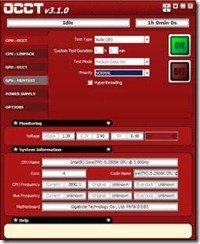 How hot should the CPU run? This is the big question and I wish I could tell you, but the fact is there isn’t any single answer. The range of normal operating temperatures for laptop CPUs runs from the low 30s (Centigrade) all the way up to 100C and it can depend on many factors including the ambient temperature in the room. When you run CoreTemp it will provide a value labelled Tj. Max. 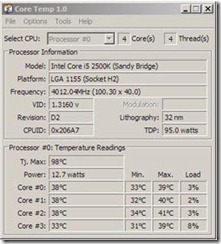 This is the maximum temperature the CPU will operate at before it will begin to shut down. For your machine what you want to be seeing is that your Core0 temp is at least 25 degrees below Tj.Max. If the difference is much less than that this suggests that your cooling may not be operating effectively. Being able to monitor the CPU’s temperature is very useful, but what CoreTemp is showing you is the temperature with the machine idling. If you are having problems with your laptop overheating then it is most likely happening when the machine is working hard. So the next stage in this is to do what is called a stress test – that simply means that you give the CPU some work to do and then monitor the temperature to see how if responds. To do this you can simply run a few programs, but it is probably more effective to download and run a stability testing application such as OCCT. This program will allow you to control exactly how much load you put on. And it will allow you to take it off quickly if overheating becomes a problem. Once you have downloaded and installed OCCT make sure CoreTemp is running and click the OCCT ON button to start the default test. After a minute idling it will start to run your CPU at close to 100% capacity. Watch your Core Temp readings for (Core 0, etc.) and see how much the temperature rises. If your laptop has an overheating problem the temperature will quickly rise to meet the TJ. Max figure. You can end the test at any time by clicking the OFF button. When you end the test, watch the temperature readings and observe how quickly they return to normal. If the cooling system is healthy the readings should be back to the pre-test figures within a minute or so. Finally, can I please point out that you must do all of this at your own risk. I am providing this advice in good faith, but I can’t be held responsible for what happens when I am not present. Please read the manuals for the software carefully and observe all of the warnings and cautions.